Roger Filgate is a guitar player. Many of you may know him by the time he spent trading licks with the great Andy Powell of Wishbone Ash, but I’m sure there are even more of you that need to know him further. Filgate released a handful of solo albums since departing Wishbone Ash in 1997, and this collection highlights the more progressive work of those records. The disc is packed with solid arrangements, blistering licks, and stylish guitar sounds. From the incessant jamming of “Say What You Will” to the emotionally driven blues of “Dissonance,” Filgate is sure to thrill every guitar lover out there. Some of my favorite tunes from this collection are those that delve into the outer reaches of rock. I love the steady rhythm that starts “Rapid Fire,” but I really love the middle of the song that tickles the fringes of jazz. When Filgate isn’t ripping things up, it’s songs like this that show what he can do stylistically. Another song that mixes his rock chops with tinges of jazz and blues is “Red Strat Shuffle.” This is a song that impresses to no end. “White Rush-In” is a song that takes the jazz and rock elements and plays around with them as well, just in a more structured song format. I was reminded of the band Rush upon hearing the track, and then I noticed the title. Hmm...a tribute to the Canadian rockers, perhaps? Any way you slice it, it’s another brilliant track. For many of you, the real treat will come at the end of this disc. Filgate includes four Wishbone Ash tracks, all of them drawn from the “Illuminations” release, done in his own instrumental brilliance. I particularly like the adaptations of “No Joke” and “Tales Of The Wise,” the latter of which is probably the most progressive piece on the disc. “Tales” explores the depths of Filgate’s creative arranging, taking twists and turns as it changes time signatures and splashes color all over a complex musical canvas. Roger Filgate is a guitarist. One listen to Progressive Collective proves it. 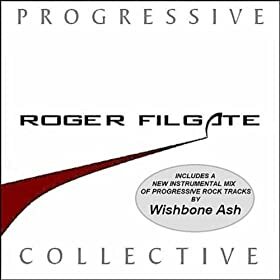 You can visit Roger on his official website, http://www.rogerfilgate.com/, and download Progressive Collective from Amazon, CD Baby, or iTunes.